Dubrovnik, Croatia lies on the coastline of the Adriatic Sea and is one of the most popular tourist destinations in the area. Named a World Heritage Site in 1979, the total population of Dubrovnik is just under 43,000. A bustling seaport, the Dubrovnik economy relies heavily on nautical trade and has done so for centuries. Dubrovnik is an amazingly beautiful place filled with art, culture and a long, storied history dating back to the 7th century. Ancient myth held that Dubrovnik, then known as Ragusa, was founded by refugees fleeing from nearby Epidaurus, the site of a vicious Slavic invasion. New archeological discoveries, however, support the theory that the construction of the city took place before the Slavic invasion and Dubrovnik was built and populated by more than Dalmatian refugees. Evidence suggests that while the Dalmatians may have been involved in the construction of Dubrovnik, Greek settlers may have also called this place home. Dubrovnik has seen its fair share of rulers over the centuries. Once under the protection of the Byzantine Empire, it came under the rule of Venice after the Crusades and then, in 1358, received independence from Hungary. Dubrovnik was a free state until 1808. In 1806, Napoleon’s forces invaded its bordered, and Dubrovnik eventually surrendered. The republic was abolished and the city fell under French rule. However, with the Congress of Vienna in 1815, the Habsburg Empire took control. Intending to promote economic stimulus, it introduced a series of legislature to provide for taxes, education and trade. Ultimately, most of these measures failed and Dubrovnik remained largely sovereign until 1921. Austria-Hungary fell in 1918 and Dubrovnik was shuffled into the new Kingdom of Yugoslavia. It fell under Nazi rule during WWII and in 1944 Tito’s Parisians executed 78 Dubrovnik citizens without a trial. Attacked once again in 1991 shortly before the Yugoslavian break-up, 114 people were killed including a popular poet. Over half of the city was destroyed by heavy artillery. While Dubrovnik has since been rebuilt, reminders of the shelling can still be seen. Dubrovnik, although ancient, can be thought of as incredibly progressive. It abolished the slave trade in 1418 and founded an orphanage shortly after. The first pharmacy opened in 1317 and is still functioning within the city today. 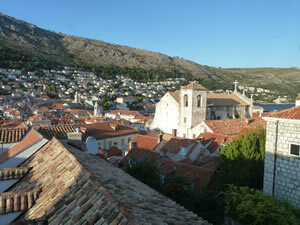 Dubrovnik was a pioneer in taxes, medical care and water supply systems. Today, Dubrovnik is a hub of culture in Croatia. Art, music and especially literature are popular here. As a World Heritage Site, the ancient buildings have been restored in great detail. The Rector’s Palace and St. Blaise’s Church are historical sites not to be missed. Dubrovnik is an exercise in history, progress and beauty. Have a look at the deals below for some great, cheap Hotels in Dubrovnik.